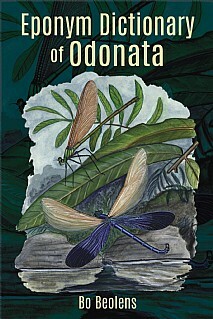 The Eponym Dictionary of Odonata is a comprehensive listing of all people after whom damselflies and dragonflies have been named in scientific or common names. Each entry provides details of the species and a brief biography of the person. It is also cross-referenced so that the relationships between scientific authors, entomologists and others can be followed. Many entries have been contributed by the people so honoured who are not necessarily odonatologists, entomologists, zoologists or even great men of science. Many damselflies and dragonflies are named for the author’s family members, friends and those who collected the species holotypes, while others are figures from myth or history. In fact, it could be anything from the author’s mother to a favourite musician! Because entries may include details of dates, places, educational and work institutions, it is possible to discover information about each person and for a picture to be built of how the science sometimes follows groupings of colleagues or those significantly influenced by charismatic teachers. The Dictionary includes other names which might, at a glance, be thought to be eponyms yet are not in the truest sense. These may be species named after characteristics embodied in characters from literature, whole peoples, acronyms or toponyms, etc. To some extent it can read like a canon of the great women and men of science over the last several centuries. Interestingly there are species named after as many as three generations of the same family, veiled references to old lovers, sycophantic homage, financial patronage, etc., as well as all the more ‘legitimate’ reasons for naming species. Not surprisingly, odonatologists exhibit a range of opinion on the practice, from naming all species after people, to wanting all eponyms banned; they can be totally humourless and pedantic or full of fun and irreverence. Like all of us they have as many reasons for their namings as ordinary folk have for naming their children or pets! Underlying all this, however, is the value of this volume in cataloguing this fascinating aspect of science for all users, whether scientists or interested lay readers. This will be of immense appeal to entomologists with an interest in Odonata, academics and practising field scientists, students in these subjects, scientific libraries and anyone with an interest in damselflies, dragonflies and the history of science.